Choose between For Honor or Ghost Recon: Wildlands. Nvidia did its customers a solid by slashing the price on its GeForce GTX 1080 graphics card. 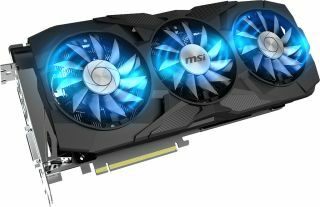 We took a look around to see what is out there and found a pretty good deal on MSI's GeForce GTX 1080 Duke 8G OC card. It's available from Newegg for $500, and is eligible for Nvidia's free game promotion. Like many of Nvidia's hardware partners, MSI offers several models of the GeForce GTX 1080. The Duke 8G OC is an overclocked variant that's been goosed to 1,708MHz and 1,874MHz for the core and boost clockspeeds, respectively. Those are up from Nvidia's reference clocks of 1,607MHz (core) and 1,733MHz (boost). MSI also pushed the card's 8GB of onboard memory past reference—it sits at 10,108MHz, which is about a 100MHz overclock. In addition to faster clockspeeds, the Duke also sports a triple fan cooling solution with three PWM fans that only spin up when temperatures rise above 60C. Otherwise they remain still and silent. On the underside of the cooler is a large solid copper heat sink with 8mm "Superpipes" (heat pipes). At the time of this writing, this is the least expensive GeForce GTX 1080 on Newegg's website. You can grab it here, along with your choice of For Honor or Ghost Recon: Wildlands.